McDonald’s is continually trying to up its game: The recent switch from frozen to fresh burgers (some of its burgers anyway) is just one indicator of the fast-food king’s attempts to retain dominance in an increasingly crowded market. The chain’s headquarters is also moving from its considerable campus in the western Chicago suburb of Oak Brook to a location more centrally located to downtown Chicago. 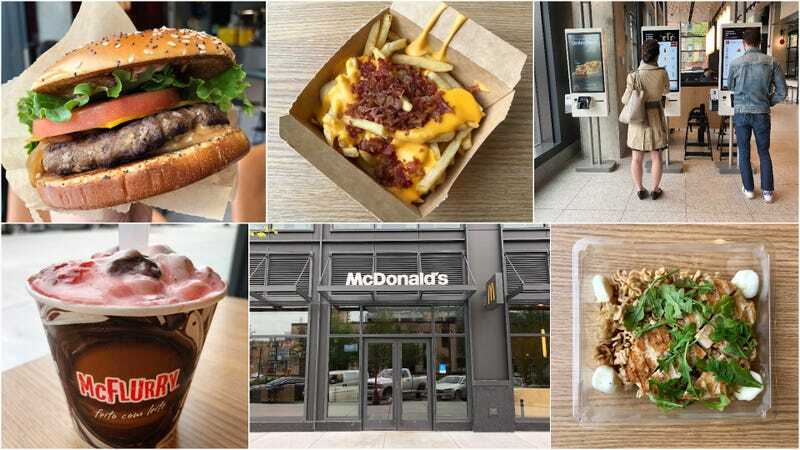 Located in the West Loop neighborhood, the new McDonald’s home base will be situated in the center of Chicago’s buzziest restaurant district, possibly offering some inspiration to the chain as it nestles in among the city’s most prolific culinary innovators. McDonald’s new flagship restaurant, which opened in April on the ground floor of its new headquarters, offers some innovation itself. As with many of the chain’s more modern branches, while cashiers are still there, there are also self-serve kiosks, and table-tent numbers so that servers can bring out your food to you. A digitized display above the counter tells you where our order is in line. The cafe section offers a considerable variety of pastry more elaborate than packaged danishes and apple pies. But the main attraction to this McDonald’s, besides its fancy furniture and luxury lighting, is the international menu. The chain offers a rotating menu of different items from international McDonald’s, so I headed out to check out the current lineup: the Mighty Angus Burger from Canada, the McSpicy Chicken Sandwich from Hong Kong, Australian loaded bacon-and-cheese fries, the McFlurry Prestígio from Brazil, and two salads from France. Since there was no way I could eat all of this by myself, I dragged my husband along. The Angus burger really didn’t taste a lot different from other McDonald’s specialty burgers, but that doesn’t mean it wasn’t great. The fresh-over-frozen difference in the meat patties is palpable; this burger even seemed thicker and less greasy than a Quarter Pounder. The add-ons included bacon, grilled onions, and a “smoky Angus sauce,” bringing to mind the Western Whopper of yesteryear. It was a formidable burger. Thing is, when I usually hit McDonald’s it’s because I am craving the very specific tastes of a Filet-O-Fish or a Big Mac, but the Angus Burger was an inspired enough fast-food choice to possibly make me change my mind to try something more unusual. Speaking of specific tastes, my husband and I could not figure out what supposedly makes this sandwich so different from the regular spicy McChicken sandwich. Again, not to say that this wasn’t a fine sandwich in its own right—with copious amounts of lettuce and appealing seasoning—but we’re pretty sure we don’t have to go all the way to Hong Kong to get it. McDonald’s fries are exemplary and unparalleled in the world of fast fried food. So you have to be really careful when messing with a classic; this effort failed miserably, resulting in our first major menu misfire. Why would you ruin perfectly good McDonald’s fries by adding a sub-par gloppy cheese sauce and bacon bits? I said this dish basically tasted like red and brown sodium; my husband said it was like getting hit in the face with a five-pound brick of salt. When we brought our considerable leftovers home, even my son turned these down—the first time in his life he has ever rejected French fries—and they were mercifully tossed. Honestly, this was the most impressive thing we ate on the McDonald’s International menu, simply because it didn’t taste like anything we’d ever had from McDonald’s before. The grilled chicken was nicely seasoned, set on a bed of arugula and tangy balsamic-dressed pasta. The balls of mozzarella were Italian-deli worthy. It would make for a convenient healthy and tasty lunch when you’re at McDonald’s for whatever reason (like a road trip) and you’d rather have something less greasy, more green (even if it’s mostly pasta). This salad paled in comparison to the other one, and, like the chicken sandwich, tasted awfully familiar: crispy or grilled chicken on top of a mix of lettuces, alongside grape tomatoes, dried cranberries, and sliced apples. What helped this salad along was the fact that you could order actual blue cheese dressing, with Paul Newman’s face nowhere in sight. Both these salads came with breadsticks, but forget it. They tasted like small sponges, and would have been better used for wiping the table. Maybe it’s been too long since I had a McFlurry, but 2/3 of this was straight-up delicious: McDonald’s exemplary creamy vanilla soft-serve swirled with a rich strawberry sauce, laced with berries. But thrown in throughout the McFlurry hid a bunch of chocolate-covered coconut pieces; the cold made them difficult to chew. Plus it was too much on top of too much: A perfect little swirly sundae doesn’t need the equivalent of at least two full Mounds bars attached. I left a bunch of chocolate pieces at the bottom to give to the kids, which, again, is something I never do. So while the International Menu items were hit-or-miss, the biggest takeaway from this new McDonald’s is that it felt like a wholly re-invented McDonald’s experience. Space-age kiosks. Next-level food (well, at least for a burger and a salad). Cushy furniture and flattering lighting. No one ever really wants to hang out at a McDonald’s for longer than it takes to eat the food (or drive through the drive-thru). This McDonald’s seemed more like an actual restaurant—with its free WiFi and AirPad charging stations, I could see hanging out there for a longish lunch some afternoon. Probably with a Mozza salad, and a Brazilian McFlurry for dessert.